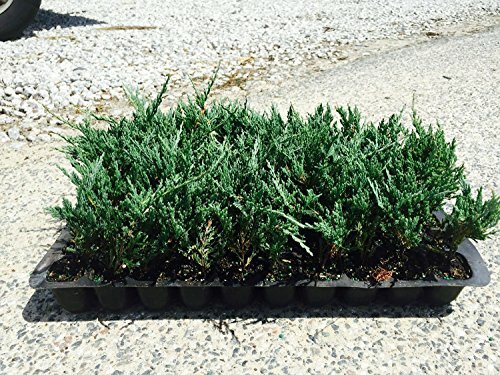 60 count trays of Bar Harbor Juniper, 2", fully rooted plants. Creeping juniper is a procumbent evergreen shrub that is native to Canada and the northern U. S. where it typically occurs in sandy and gravelly soils, sand dunes, rock outcroppings, slopes, prairies and stream banks. It forms a low ground cover that generally rises to 6-18" tall but spreads by long trailing branches with abundant short branchlets to form an often-dense mat. Foliage is primarily scale-like (adult) with some awl-like (juvenile) needles appearing usually in opposite pairs. Foliage is typically green to blue-green during the growing season, but often acquires purple tones in winter. Fleshy seed cones (dark blue berries) generally mature in two years, but are often absent on cultivated plants. 'Bar Harbor' is a relatively fast-growing male cultivar which features blue-gray foliage that becomes purplish in winter. For large quantity discount consideration, please message us. Juniperus horizontalis 'Bar Harbor', is a creeping juniper that features blue-gray foliage in summer and then changes to purple in the winter. The Bar Harbor's chameleon-like leaves have long, sharp points that come in pairs or threes when juvenile, and then become more scale-like or flat when they are adult. It grows in average, medium moisture, well-drained soils in full sun. Bar Harbor adapts to a wide range of soils, but prefers a dryish, sandy soil. It tolerates hot, relatively dry growing conditions, somewhat poor soils and many city air pollutants. This easy-to-grow evergreen groundcover transforms into bluish green foliage in spring but turns plum purple in winter. Its dense, trailing growth habit spreads 8-10 feet (12 inches tall). Ideally used as a groundcover, foundation plant, and cascading over walls. This low-maintenance, evergreen needs a regular water schedule to ensure the growth of a mature root system. After the mature root system is established, watering is needed occasionally, except during a drought, watering is needed regularly. Prune once or twice a year around the edges in order to keep the middle of the plant full.